Ten years ago in 2008, Track Trailer (TT) ‘invented’ the hybrid by slipping the lessons learnt and the basic underpinnings of the hard-shell Tvan under a larger, couples-only pop-top. They called it the Topaz. It wasn’t quite as bush-brave as the Tvan, but it didn’t fall far short despite being taller and heavier. A width of just 1938mm (76in), great ground clearance and TT’s patented MC2 asymmetrical suspension took it further feral than anything but a camper trailer at the time; its only true rival then being Kimberley’s pop-up offering. The distinctive wedge-front styling and industrial look, with distinctive laser-cut body corner extrusions, matt-finished aluminium sandwich panel wall construction and powder-coated metal interior was polarising. 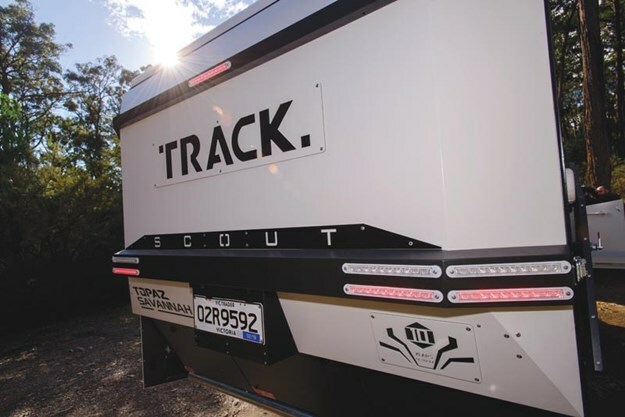 Nevertheless, it and paved the way for a succession of other local manufacturers and importers to enter what became Australia’s fastest-growing RV segment. 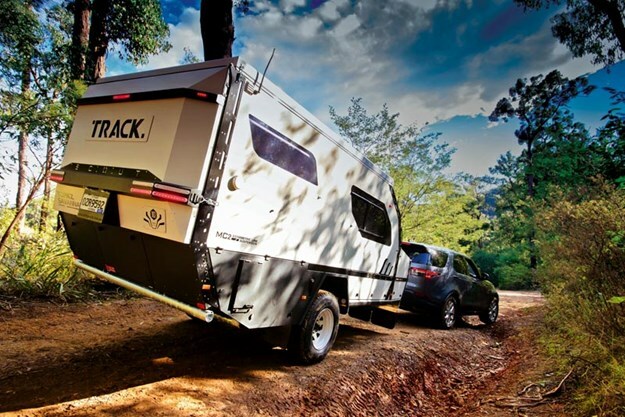 Not to be left behind, Track Trailer responded in 2012 with the Topaz Series II, spreading its chassis to allow the spare wheel to be housed between the main members. 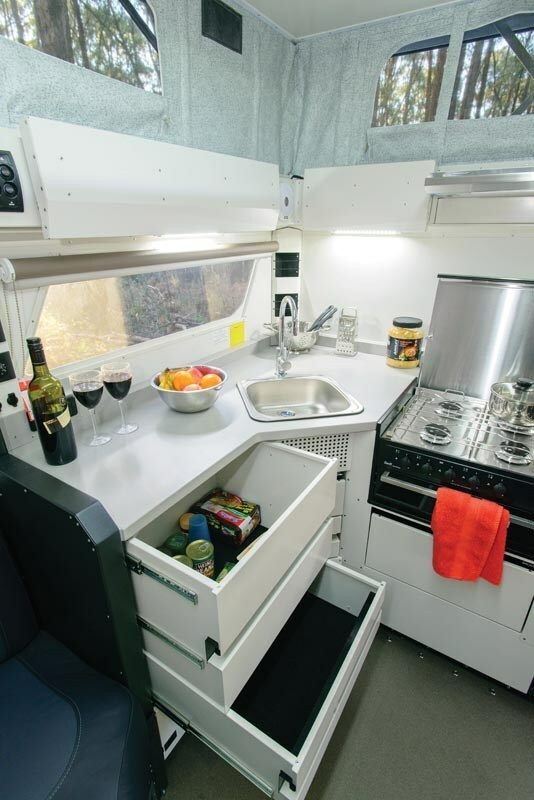 The body was reworked to incorporate two huge watertight front storage lockers and create more headroom above the bed, which was offered in various longitudinal or transverse configurations. Opening glass side windows also arrived, but as these were very expensive to manufacture because of their unique shape, so they were soon replaced by optional sliding glass openings. Despite these changes, which were big by TT standards, but modest by others’, the Topaz still stood apart from its Hybrid rivals. Deliberately. 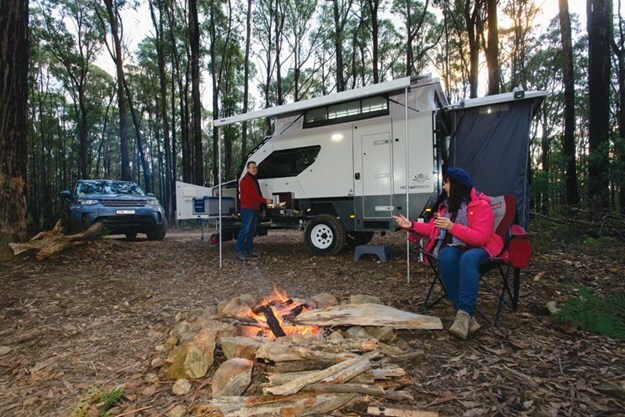 Being Melbourne-based, TT assumes its predominantly Victorian customers will spend a lot of their time travelling to warmer climes, with many overnight stops on their way, rather than the ‘stop and prop’ camper trailer approach taken by those from the northern states. So it has kept the Topaz minimal and light to get it there and beyond. As with the Tvan, TT also knows that its customers appreciate design and are prepared to pay a premium for something that reflects their values, rather than being simply a tool for a job, so distinctive, clever and edgy design are very much part of the model’s ongoing DNA. Having said this, there’s no denying that the Topaz has fallen behind the hybrid pack in offering some features that many travellers now expect. For example, there’s no internal shower and TT’s token indoor/outdoor portable toilet solution is less convincing than the more elegant solution pioneered by Rhinomax for its smaller Scorpion. It also took TT eight years to offer a Tvan-style drop-down rear shower pod to replace the flimsy triangular rear tent of early models, but customers were prepared to wait until its builder got it right, rather than rush to market with a less-perfect solution. After all, TT reasoned, it wasn’t necessary to compromise the design to incorporate a space-robbing feature that would be used once or twice a day. This 'no compromise’ approach has worked in in the Topaz’s favour. Even in its latest 10th Anniversary ‘Scout’ guise, it’s unmistakable for anything else and that’s an important part of its appeal. Which brings us to the new, Limited Edition Topaz Scout. Effectively it’s a selection of popular long-term touring options that have been packaged to create a new model. Available until the end of this year, the Scout Pack can be added to any of the four current Topaz models when built to order. 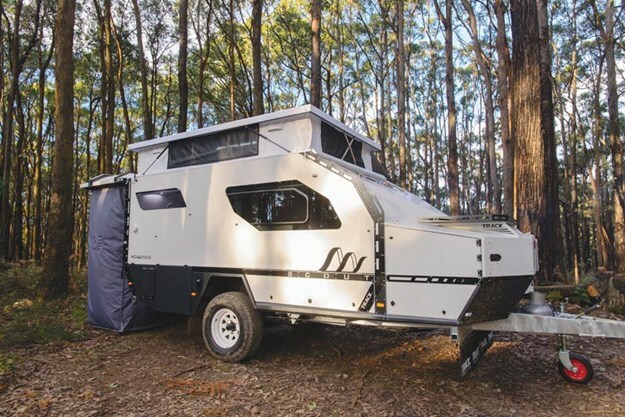 It includes any one of the three optional North-South bed configurations, the external rear shower pod, an upgrade to twin, 105AH Lead Crystal batteries with Bluetooth Smartphone management, a handy under-bed storage net to stop your stuff sliding all over the kitchen floor and two more front mudflaps for an additional $3240 – a 50 per cent saving on the RRP of these options when ordered separately. Scout Pack models are identified by their 10th Anniversary branding and decals, and the white exterior finish on their front storage areas. If you want to individualise your Topaz more, you can choose from 10 external-highlight and matching internal-drawer-trim colours. Our highlight colour was black, which suited the Topaz very well, as it matched the remaining lower body sides and the front metal stoneguard. You might say that some of the features offered in the Scout Pack should be standard on a Hybrid whose price starts at $88,300 for the entry-level Eyre and extends to $99,400 for the better-equipped Silverton – I don't disagree. As with the Tvan, however, you are paying a premium for the core engineering and the bling is your business. Adding the Scout Pack to our review Eyre took its RRP to $91,540 which is about mid-range in today’s locally-made Hybrid market. The Topaz, with its no-frills exterior and industrial-look interior, appealed to me from the first time I saw the prototype at Melbourne Leisurefest back in 2007. What really surprised me was that my wife, who nobody would call a ‘dirt-under-the-nails’ type of camper, really liked it too! Later, we enjoyed quality time in a new Series II model we took to the tip of Cape York in late 2012 and returned even more impressed. I think the liveability of its expansive kitchen impressed us, while we loved the confident way it towed over all sorts of surfaces, its compact dimensions and the purity of its design. So meeting the latest Topaz was reassuringly familiar, even though the rash of hybrid rivals means it now has to be judged on criteria other than the purely emotional. Back then, and now, the stand-out feature of the Topaz has been its proven go-anywhere ability, thanks largely to its size-packaging, its sturdy hot-dipped galvanised chassis and its genuine military grade MC2 suspension. You can see how well it works if you ever travel behind one and observe the long wheel travel that allows it to follow the road contours so confidently. This time its capabilities were well matched by the latest Land-Rover Discovery TD6 S up front, which could take the Scout just about anywhere it wanted to go. The two were a great pair, combining few frills in the base S model of the new Discovery range with the impressive capability of its 600Nm 3.0-litre single turbo diesel engine, eight-speed transmission and its arsenal of offroad and towing ‘smarts’. Interestingly, they were almost line-ball priced, with the Discovery as tested with options coming in at $101,070. Weight and width were also ideal, with the Land-Rover's new lightweight architecture tipping the scales at 2298kg (5066lb) and measuring 2070mm (81.5in) in width, while the Topaz Scout weighed in at a lighter 1670kg (3681lb) and was a slim 1938mm (76in) across the beam. The Topaz’s other exterior strength – its cavernous storage capacity – is also unchanged from the previous Series II. 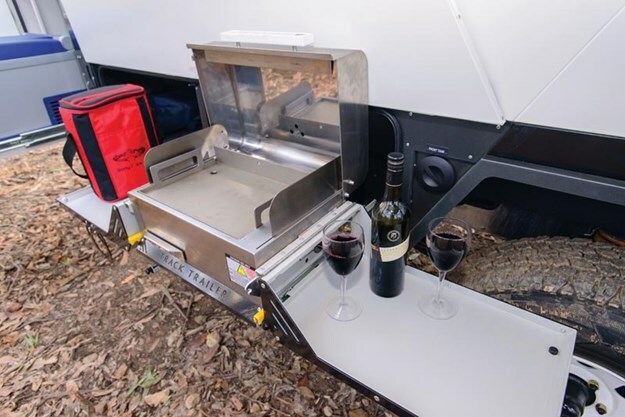 It starts at the prow-shaped front, where the storage box has slides to hold a cabinet-style fridge of up to 80-litres in capacity on the door side and a portable generator on the other. Meanwhile, the adjacent front compartment will hold frequently used items like folding chairs, hoses, power cords, pegs, etc. The under-body lockers are just as capacious. The first is a large, full tunnel. The adjacent locker houses a slide-out gas barbecue, with clever ‘wings’ that turn it into a kitchen. The front metal stoneguard is designed to be removed for repainting after an off-road trip, while the wood-rack above the storage boxes can be optioned to hold bikes, if required. On the other side, there’s more storage space in the unencumbered middle locker, while the Topaz’s portable toilet is strapped securely in its own rear locker that it shares with the vehicle’s 14-litre gas/electric hot water heater. The space beneath them houses two sturdy rear corner legs, which stabilise the Topaz overnight when slotted into receivers in the galvanised rear bumper. 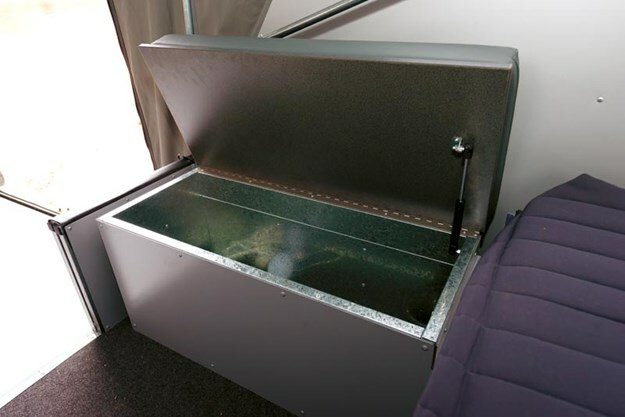 At the rear is the pop-top’s unique top-hinged fibreglass shower ‘pod’, which borrows technology from the Tvan to house a drop-down tent with built-in drain holes that is designed to be pegged at each corner. It is large enough to house the portable toilet when in camp, to form a full exterior bathroom. You pop the top by releasing four external over-centre latches and then pushing up on two over-centre bar,s and the roof rises in seconds on is telescopic struts. It's worth noting though that it’s harder to lift the front end because you need to kneel on the mattress for leverage. You then enter the Topaz via its sturdy, bespoke door, helped by a stylish laser-cut handle, to be greeted by its 85-litre compressor fridge on your right. This sits under a large, powder-coated kitchen bench that angles around onto the opposite wall, with a four-burner cooktop and grill in the centre. Deep, marine-carpet-lined soft-close drawers on sturdy metal runners are held closed when travelling by simple slide-bolts. The light switches are grouped in modules next to the door and to the left of the kitchen, where you’ll also find features like the battery condition gauge and the water level gauge. 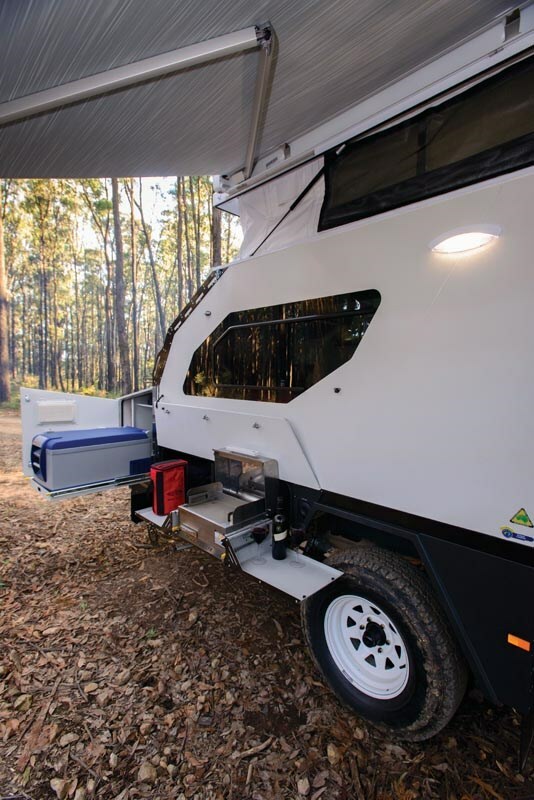 The expanse of powder-coated steel is a shock at first for those used to campers with lounge room pretensions, but to many it’s a key part of the Topaz’s appeal. 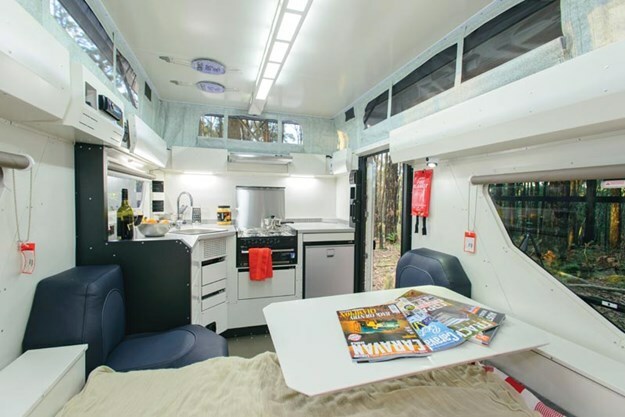 ‘Our’ Scout was configured with a north-south Queen bed, which left room on either side for roomy metal lockers, matching their top-hinged counterparts that line the upper walls. A useful clothing net hangs from the front wall and this is ideal for daily dressing. More storage for plastic bins is found under the foot of the bed, with the standard mesh screen on the Scout keeping everything in placed when travelling in difficult terrain. Cut-outs in the metal cabinetry are everywhere for storing small items. Roller blinds on the front and side windows keep the light at bay on those early Northern Australia mornings. Typical of the rest of the van, the single pedestal laser-cut dining table swings away across the bed when not in use, revealing both a single and a two-seater leather seat facing one another. Even when occupied for meals, this dinette leaves ample room in the kitchen for cooking. As mentioned previously, the original opening trapezoidal windows fitted to the Topaz II have now been replaced by sliding glass versions with magnetic midge-proof screens and, once unlatched, they can be opened or closed from both sides. The front window remains fixed for ideal dust-proofing, while the rectangular rear window has been removed on Scout models because of the shower pod. With the roof popped and its surrounding skirt unzipped to expose fly-mesh panels, there is plenty of airflow inside to keep you comfortable on tropical nights, supplemented by a standard 12V Sirocco fan on one side of the bedhead. The Topaz still isn’t for everyone, even with its more ‘comfortable’ Scout Pack, but the longer you live with it, the more you realise that the absence of some of these ‘extras’ aren't a drawback – in fact, the simplicity of this hybrid camper is its biggest asset.